Union County Sheriff Jamie Patton, Preble County Sheriff Michael Simpson, Cochise County, Arizona rancher John Ladd, Shelby County Sheriff Lenhart and Shelby County Commissioner Julie Ehemann views through fencing at the Arizona-Mexico border while attending the outreach program, “From Our Borders to Yours: Ground Zero” during the first week of April. 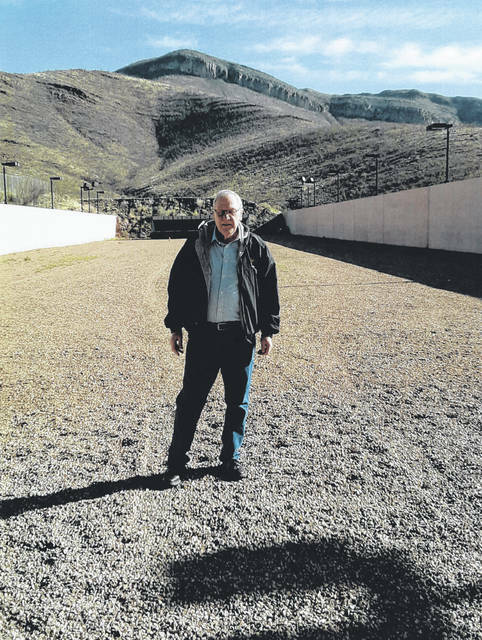 Shelby County Sheriff Lenhart is pictured at the Arizona-Mexico border while attending the outreach program, “From Our Borders to Yours: Ground Zero” during the first week of April. 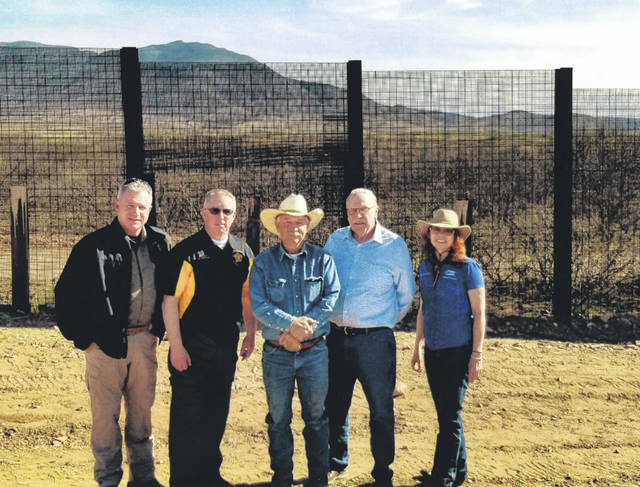 Union County Sheriff Jamie Patton, from left, Preble County Sheriff Michael Simpson, Cochise County, Arizona rancher John Ladd, Shelby County Sheriff Lenhart and Shelby County Commissioner Julie Ehemann are pictured in front of fencing at the Arizona-Mexico border while attending the outreach program, “From Our Borders to Yours: Ground Zero” during the first week of April. SIDNEY — With so much talk and confusing information relayed in the national news about the southern border, immigration and how to address it, Americans in the middle of the country may feel removed or uncertain about what to believe. Shelby County Sheriff John Lenhart recently got an up close and personal view of the situation along the Arizona-Mexico border and is sharing what he saw after attending the outreach campaign, “From Our Borders to Yours: Ground Zero.” The program was funded by the National Sheriff’s Association Educational Foundation. Cochise County Sheriff Mark J. Daniels, in Arizona, and the National Sheriff’s Association extended the invite to Lenhart, Preble County Sheriff Michael L. Simpson, and Union County Sheriff Malcum J. “Jamie” Patton. Lenhart also brought along Shelby County Commissioner Julie Ehemann, president of the County Commissioners Association of Ohio (CCAO) board of directors for 2019, to explore the border situation April 3 through 5. The goal of the program is to help foster a better understanding of the impact of illegal border activity on local law enforcement and the communities they serve. “It is more problems; more issues than I thought it was. Then I talked with the local sheriff’s office, the border patrol, and then I talked to ranchers and citizens in Cochise County. It is the farthest east county on the Mexican-American boarder. It butts up against New Mexico,” Lenhart said of the county that is 15 times the size of Shelby County. Shelby, Miami and Auglaize Counties, Lenhart said, have about 400-square-miles; Cochise County is about 6,400-square-miles. 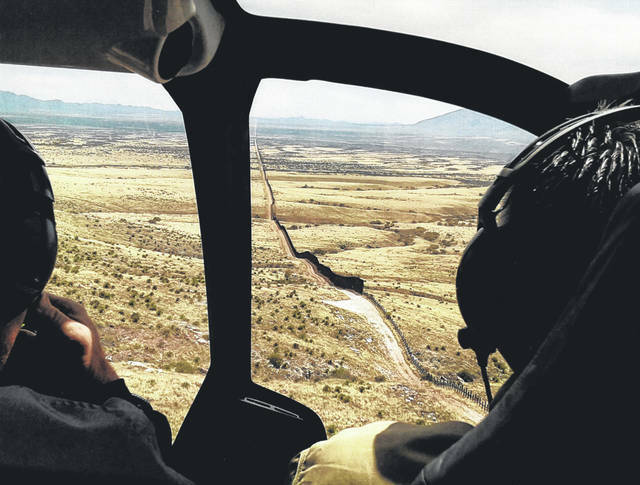 The group toured the 83-mile-long Cochise County border for about 3.5 hours by helicopter. The title “From Our Borders to Yours: Ground Zero” Lenhart said was appropriately named because the activity at the border also effects Ohio and Shelby County citizens’ social services. In Sidney alone, Lenhart said for example, there are at least 60 non-U.S. resident children attending Sidney schools. “I’m trying to report what I saw and what I heard, and then I’ll leave somebody else to decide (what they think), and I think that is important,” Lenhart said. He emphasized that he is not expressing an opinion about the issue. 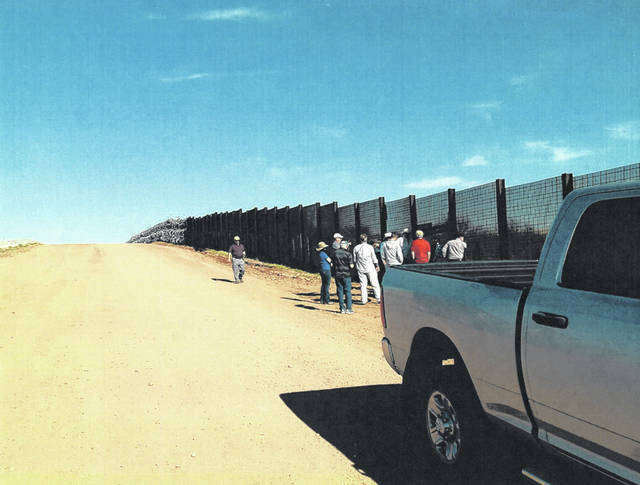 While observing Cochise County by helicopter or by live video in the boarder control and sheriff’s office’s headquarters, he saw border fencing that ranged from 18-foot-high barbed wire barriers, to simple barricades (as was used in WWII) that can easily be stepped over, to flimsy or non-existent fencing between the United States and Mexico. He reported seeing crossing areas where Mexican children came into the United States from Mexico to be educated for free and then would return home at the end of the day. He also saw live videos of “human mules” transporting drugs on their backs into the U.S. in extremely remote and treacherous mountainous areas at the border. Over the two and half days he witnessed, people associated with Mexican drug cartels carry up to 1,500 pounds of drugs over the border. Lenhart said they would drop the drugs, call for someone else to come pick up, then travel back to the Mexico side, and then repeat. There also are people he saw legally crossing through the ports to come work in the U.S. The majority of people who cross over are asylum seekers, he said. “The border control has their own and the sheriff’s office has their own (headquarters). It’s a massive intelligence gathering network,” Lenhart said. He noted that because there is so much money involved with drugs, the corruption of U.S. law enforcement is high down there. Lenhart carried several pictures taken while touring the area. One of the pictures he displayed was of a Cochise County resident’s home, which resembled a concrete and steel fortress. All of the windows were tightly closed with electronic steel shutters. Lenhart said the homeowner, who lives five or six miles from the Mexico border, has had his property broken into five times within the last four years, and also his brother-in-law was killed. Lenhart said all ranchers there are armed. “They are very bitter and angry. They need automatic or semi-automatic weapons to survive. That is a different setting (there) than in our area, Columbus or Dayton,” Lenhart said. In Cochise County alone, Lenhart said there are 3,300 federal agents, which includes border control, immigration, FBI and customs protection officers working along that area of the border. “Those folks out there will tell you that immigration laws needs changed. The asylum law obviously needs changed. They told me that because of the amount of people coming there from Guatemala, Honduras and El Salvador, and Mexico, but mostly the first three, they are bursting at the seams. The courts can’t keep up. The law enforcement can’t keep up,” Lenhart said. He learned that if people come seeking asylum, saying they fear for their lives, these people will be held for 20 days, but because of the over crowding in the jails, etc., they ultimately are given a bus ticket to go anywhere in the U.S. Once these asylum seekers have been cleared not to be criminals, they are told they will be contacted to return to court within one-year of receiving the “citation.” Lenhart said usually these individuals flee to sanctuary cities that welcome refugees, asylum seekers or others seeking safety, because these cities don’t not cooperate with federal immigration.